Max Maximov MM/ShutterstockHigher home prices don’t mean it’s impossible to buy a house. Saving up to buy your first home can be daunting, but it’s not impossible. 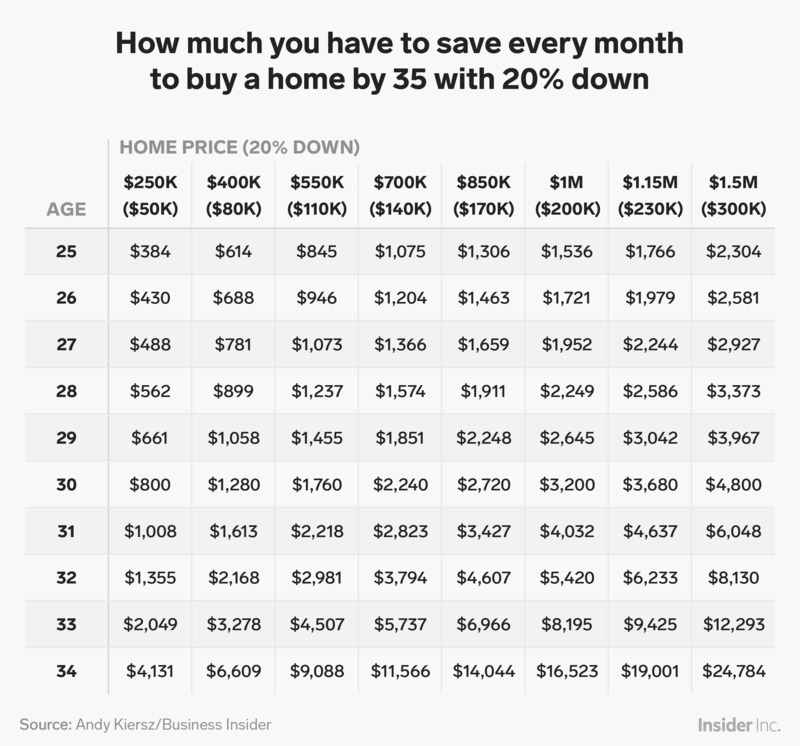 We calculated how much money aspiring homeowners need to save monthly to buy a home by the time they’re 35, depending on what age they begin saving. We ran these calculations for eight housing price points at two down-payment rates, 10% and 20%. We assumed the money is put in a high-yield savings account with a 1.6% annual interest rate. But higher home prices don’t mean that buying your first house is impossible. 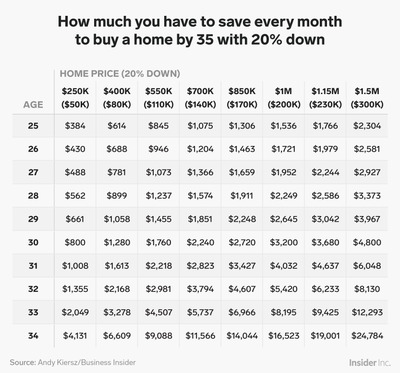 We calculated how much you would need to save monthly to have enough for a down payment on a home by age 35, depending on what age you begin saving. We looked at eight price points, from $US250,000 to $US1.5 million, and two down-payment rates, 10% and 20%. 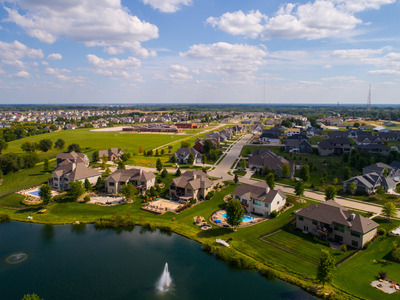 Ultimately, your target home price – and which down payment you opt for – comes down to a variety of factors, like location, income, and other recurring monthly expenses. Assuming that aspiring homeowners would need a few years post-college to get settled and make a dent in their student loans before they start saving for a house, we began our calculations at age 25. A high-yield savings account is one of the best places to save for a down payment because it offers a higher interest rate than a traditional savings account. We chose a conservative 1.6% annual percentage yield for our calculation, but Ally Bank offers a 1.9% interest rate on high-yield savings, and Barclays offers a 2.05% interest rate. To figure out how much you should be socking away every month for a down payment, first find your target home price at the top of the graphic. (The down payment amount is listed below in parentheses.) 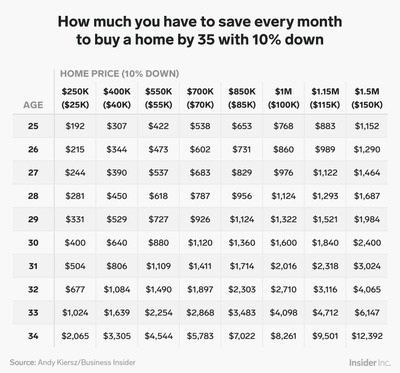 Then find your age – or the age you think you’ll start saving for a down payment – in the left-hand column. Where the two categories meet is the amount you should be saving monthly to afford the down payment by the time you’re 35. 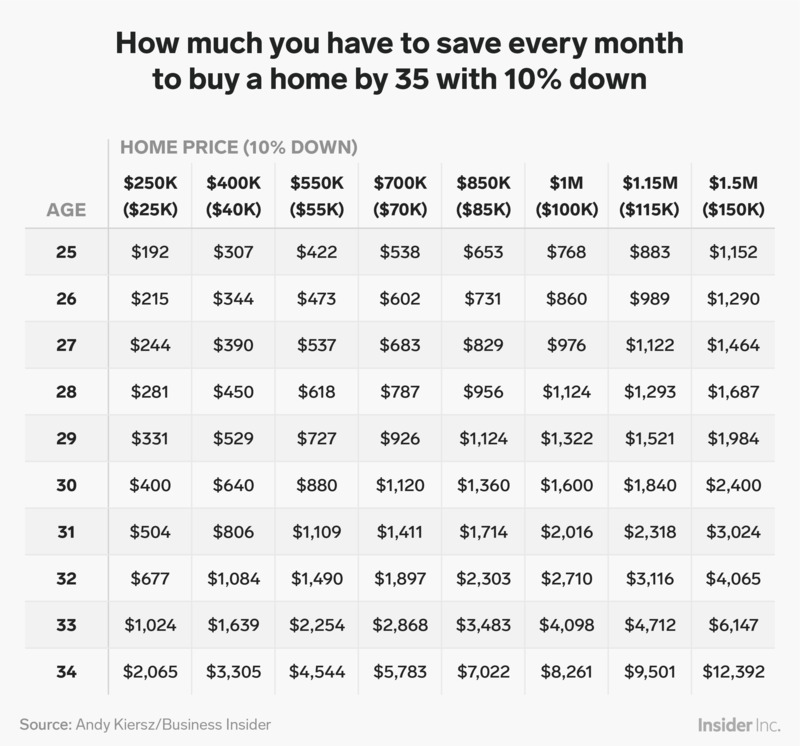 If you start saving at age 25, having enough money for a 10% down payment 10 years later is relatively achievable; you need to put only $US192 away every month if you’re aiming for a $US25,000 down payment on a $US250,000 house – not far off the $US275,000 median price of homes listed in the US, according to Zillow. But if you don’t start saving until age 30, that monthly savings amount bumps up to $US400.